There were many improvements in the treatment of illnesses during the Victorian era, stemming from a greater understanding of the spread of disease and a better knowledge of anatomy and the body's systems generally. Prevention was thought to be better than cure, and people took solutions such as Epsom salts and caster oil to keep their bodies ticking over. 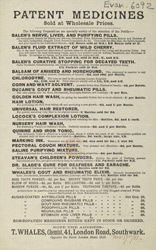 Many pills and tonics were available from chemists, and many claimed to be 'Cure Alls', stemming every illness from coughs and colds to shortness of breath and arthritis.